In December I was asked by Woolworths to do a blog post for their chopping board chit chat on grapes. I was in a baking mood and so I decided to use a clafoutis recipe to highlight the grapes. Clafoutis is usually made with cherries and as soon as I had one bite, I was taken right back to Brittany where we had our first taste of Far Breton. This traditional dessert is often made with grapes, so I was right on the money so to speak. I used green seedless grapes known as Prime and they are not very sweet and have a firm skin. It may have been better to cut them in half before I started baking, but either way, the taste it wonderful. You may be wondering what a flaugnarde is? I could not call this a flan so I turned to wikipedia for some help: This is a flan-like baked French dessert with fruit arranged in a buttered dish and covered with a thick flan-like batter. Similar to a clafoutis which is made with black cherries, a flaugnarde is made with apples, peaches, pears, plums, prunes or other fruits. Resembling a large pancake, the dish is dusted with confectioner’s sugar and can be served either warm or cold. This was originally published on the 23rd of February 2012 – in the uploading of my old blog to my new one, this post did not transfer properly and I lost the post as well as the 29 comments. Actually quite simple to make I think…must definitely try this one!! This looks fabulous Tandy. I’ve never heard of a flaugnarde; so love learning about new recipes. It’s interesting that all the fruit remained on the top and did not sink/drop to the bottom. The presentation is beautiful. It sounds delicious, Tandy! I can unfortunately not see the picture! I already tasted a similar recipe using raspberries & strawberries! I absolutely love flaugnardes! Yours sounds even better! oh, I have to make one with raspberries! Sounds delicious Tandy -a new one to me! Oh, yum! Not only a to-die-for word…I must take ‘flaugnarde’ off and use it in three sentences today – but a fantastic recipe to boot. Tandy, I always gain something great from my visits here. Thank you. 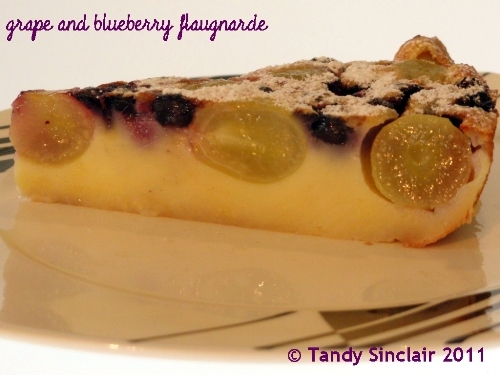 Flaugnarde – what a fabulous word and so yummy too! I love the word as well! That sounds delicious and I know the Breton cake that you mentioned.Delicious, and I’d love to try the grape version. By the way, your picture hasn’t published – it’s just a white box. thanks for letting me know Roger – I reattached it – darn techies and my blog!